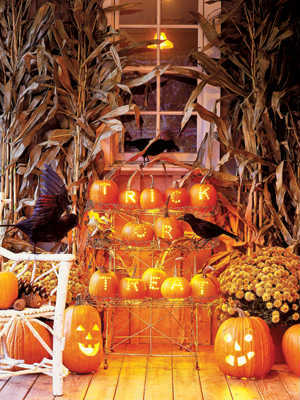 Pumpkin Greeting ~ Spell out your greeting in mini pumpkins gathered at a prominent location. Step 1: Pencil letters on hollowed pumpkins (carve out the opening from the bottom). Step 2: Using a drill with a half-inch bit, bore holes to form each letter. Step 3: Hang strings of Christmas-tree lights, gathered in small bunches, to illuminate each pumpkin (unscrew bulbs where the string descends to the next row). 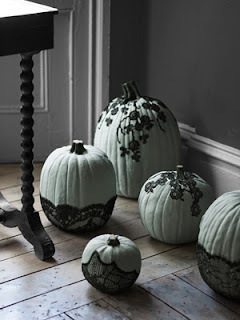 Veiled Beauty ~ Part cobweb, part creeping vine, the effect of black lace on painted pumpkins is thoroughly macabre. Begin by painting pumpkins (or faux Funkins, from $18; funkins.com). Once they're dry, use a photo as a guide to cut out pieces of lace; brush matte Mod Podge onto the back sides, and adhere to your pumpkins. Finish by sealing each with a topcoat of Mod Podge. 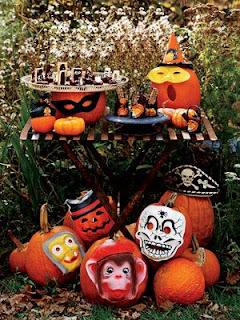 Pumpkins in Disguise ~ This way of decorating couldn't be any easier and the resulting pumpkins have a cool, vintage vibe if decorated with masks of yesteryear. 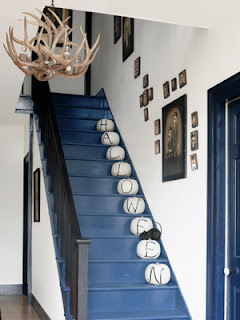 Spooky Stairwell ~ A smart alternative to pumpkin carving: Spell out a message with paint. 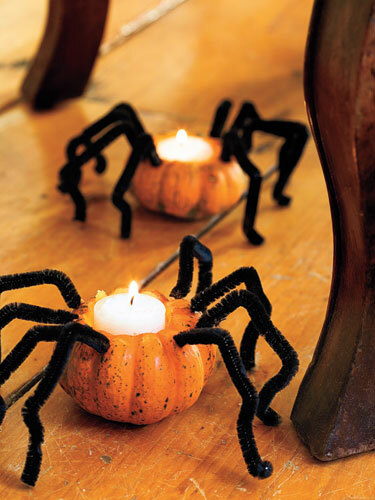 Creepy Crawlers ~ Scooped-out mini pumpkins become spidery votives, thanks to tealights and pipe cleaners. A Way with Words ~ Teach a pumpkin to recite Edgar Allen Poe's "The Raven" by spelling out a few lines with stick-on letters ("The Raven" quote decal set, $25; wgwalldecals.com), affixing them in a spiral pattern that starts at the top. To give the dark words even more presence, first use a foam brush to cover your pumpkin with two coats of white or pale-gray acrylic paint, as we did, allowing 30 minutes of drying time per coat. 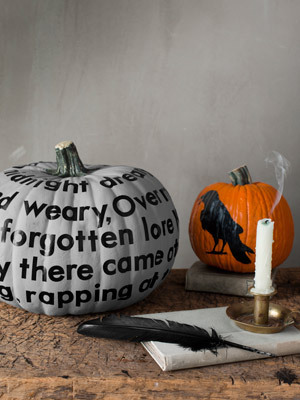 For the accompanying raven, simply apply the decal ($3; wgwalldecals.com) to a second pumpkin. 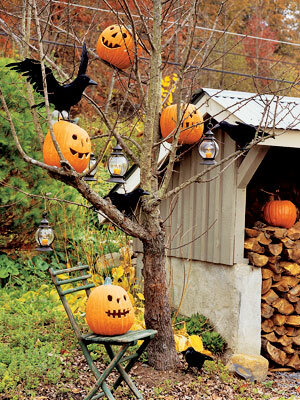 Decorated Tree ~ Bare-limbed trees provide the perfect ghostly perch for jack-o'-lanterns, candle lanterns, and a flock of faux black crows (don't be surprised if a few real ones alight). Make sure the tree limbs are sturdy enough to support the weight of the items you are hanging and take care not to overdecorate, which can lessen the overall effect. Funkins (styrofoam pumpkins) are an especially good choice for this project, since they're lightweight and won't rot.